We are now in a brand new year, chances, decisions, opportunities and endless possibilities lay before us. I adore the start of January. Christmas decorations packed away and a return to ‘normality’. 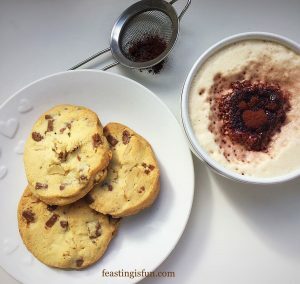 With this blog I want to bring you even more easy, yet delicious recipes and also add more savoury dishes to the menu. 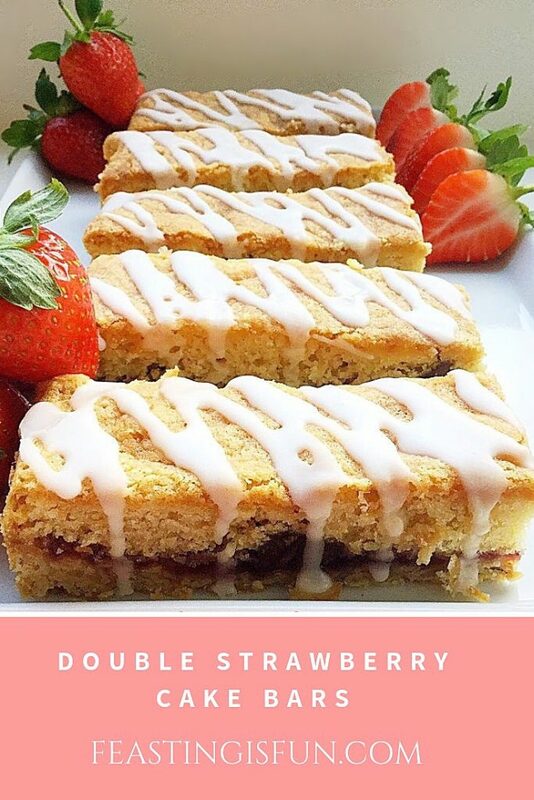 Let’s start with these Double Strawberry Cake Bars. A crisp, oat biscuit base is topped with strawberry jam and then topped with a vanilla cake sponge studded with oven dried strawberries. 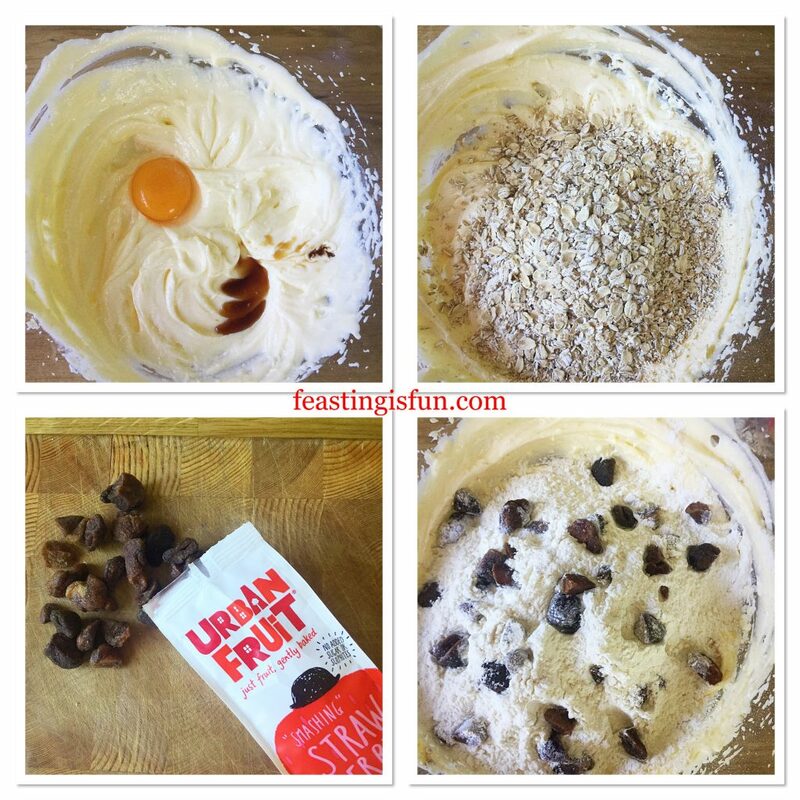 Urban Fruits sell a range of dried fruits that I have used in previous bakes such as my Strawberry Oat Crumble Cookies. Although the strawberries are dried they are not dry. Think dried apricots. Intense fruit flavour with a chewy bite. Used in these cake bars the strawberries bring an extra depth of flavour as well as texture. 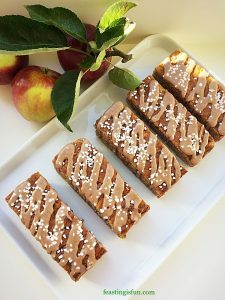 Since my hubby takes a packed lunch to work I try to come up with recipes that travel well. 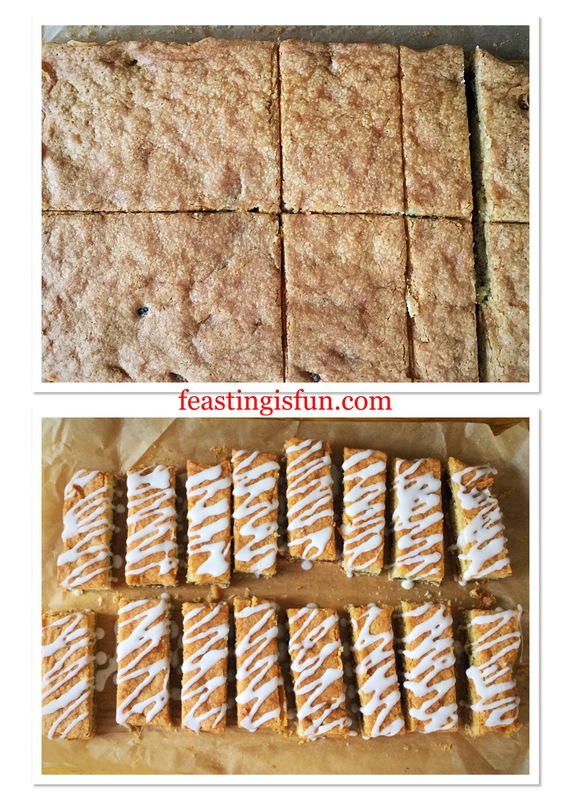 Because these cake bars have a solid biscuit base they are easy to wrap and pop into a lunch box. Likewise, during warmer months they are ideal for picnics. Food that travels well is always a bonus, as it is perfect for taking to friends homes, family get togethers and pot luck gatherings. Also these cake bars are perfect for munching on, book in one hand, snack in the other. Sometimes I find a book that I cannot put down and happily munch away whilst reading. First of all line a 22.5cm x 30cm (9” x 12”) deep tin with baking parchment. Into a large bowl add the butter, sugar and salt. Whisk together until pale and creamy. Next add the egg yolk and vanilla extract. Whisk together until combined. Sift in the flour and add the oats. Using a large spoon mix the ingredients together until fully combined. 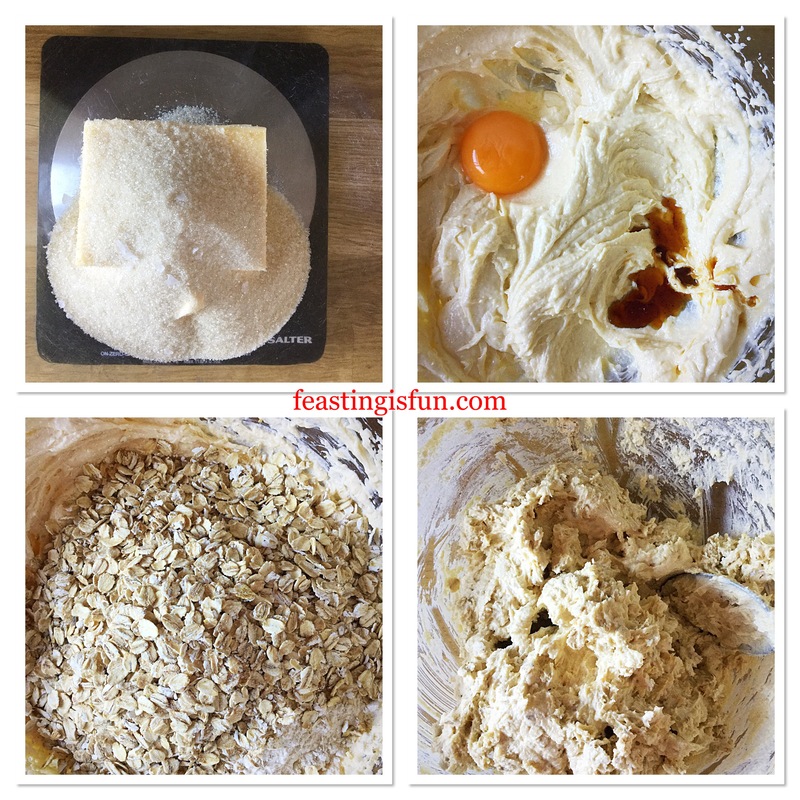 Making the oat biscuit base. Spoon the oat biscuit mixture into the prepared tin. Smooth with the back of a spoon to create an even layer. Place the tin into the fridge for 30 minutes. While the biscuit base is firming up in the fridge preheat the oven to 180C/160C fan, 350F, gas mark 4. As soon as the base has chilled place the tin into the centre of the oven and bake for 20 minutes. Remove the tin and immediately reduce the oven temperature to 160C/140C fan, 325F, gas mark 3. Chilling and baking the oat biscuit base. While the base is cooling make the cake batter. Add the butter, sugar and salt to a large bowl and whisk until combined. Next add 3 eggs and the vanilla extract. Whisk until combined. 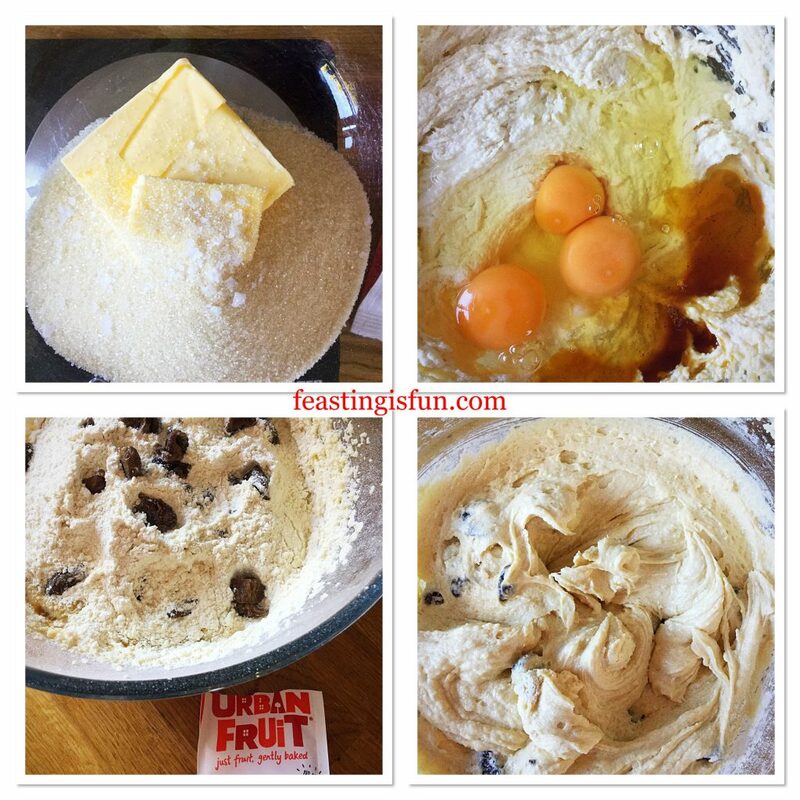 Sift in the flour and baking powder then add the dried strawberries. Stir with a spoon until the cake batter just comes together. Spoon strawberry jam on to the biscuit base, using the back of a spoon to create an even layer that does not touch the edges. Adding a layer of jam. 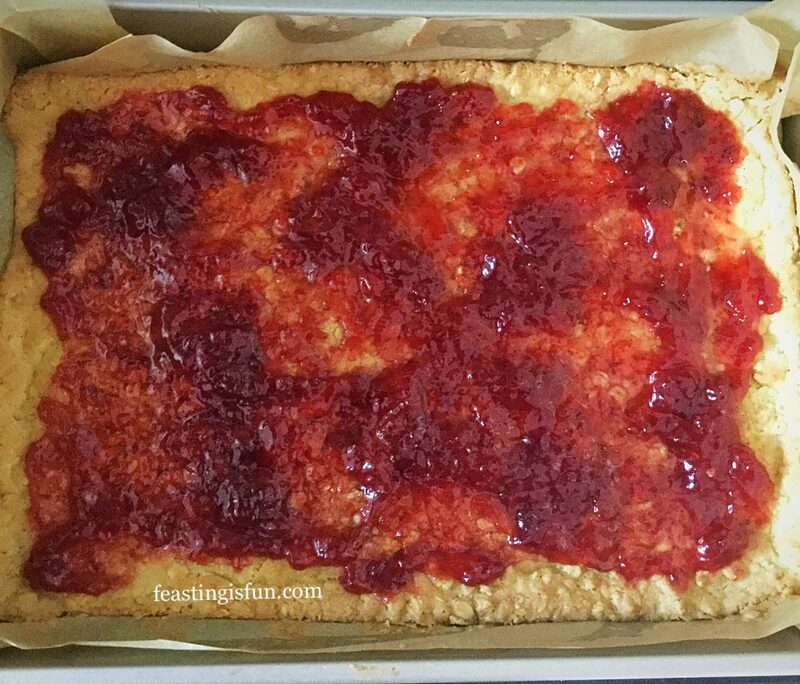 Cover the layer of jam with cake batter. I found it easier to create an even layer using a fork. Ensure the cake batter goes right to the edge. Doing so stops the jam from leaking out. Place the tin into the centre of the oven and bake for 45-50 minutes. Adding the strawberry cake layer and baking. 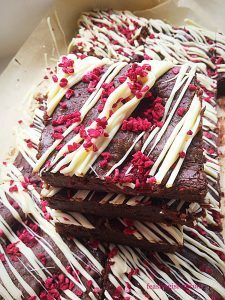 The cake layer is fully baked when it is lightly pressed and springs back in the centre. As soon as it is baked remove from the oven. 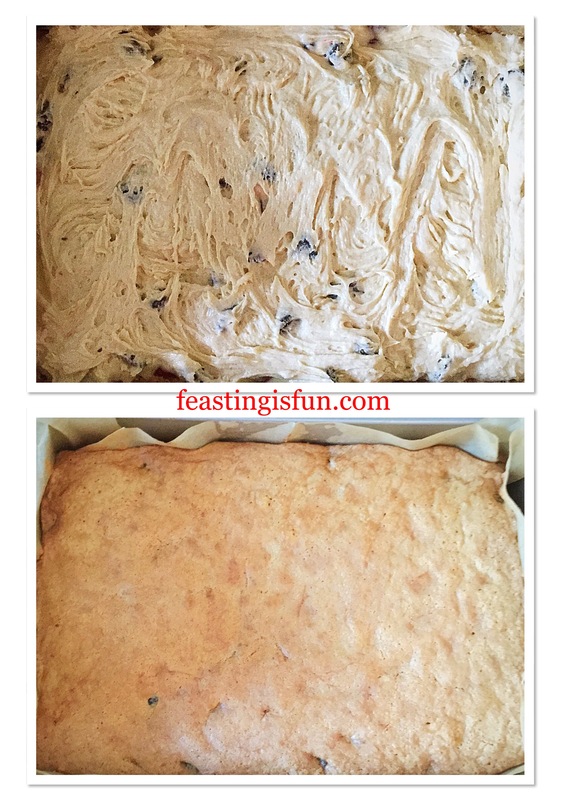 As soon as the cake is cooled lift it out of the tin using the baking parchment to help. First of all, using a sharp knife cut halfway across the width of the bake. Next cut down the centre, creating 4 quarters. 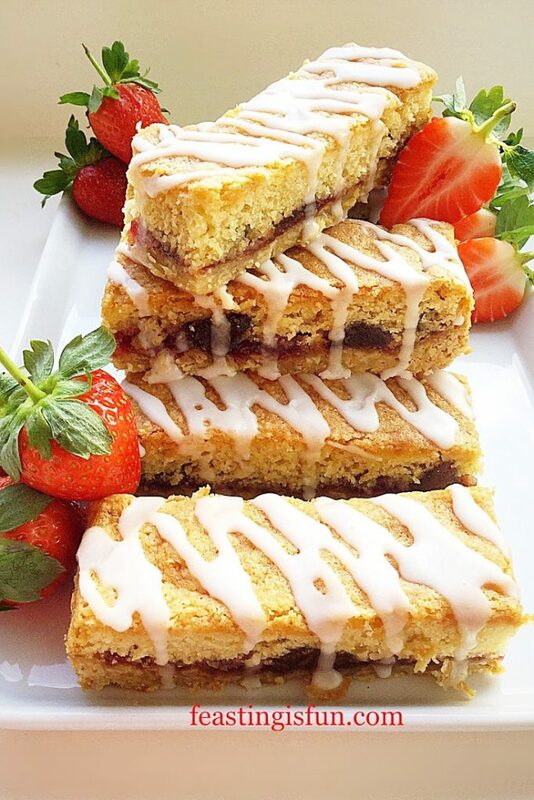 Cut down each quarter four times creating 4 Cake Bars per quarter. Separate the cake bars to enable the icing to drip down the sides. In a bowl mix the icing sugar with 2-3 tablespoons of lemon juice to create a thick yet flowing icing. 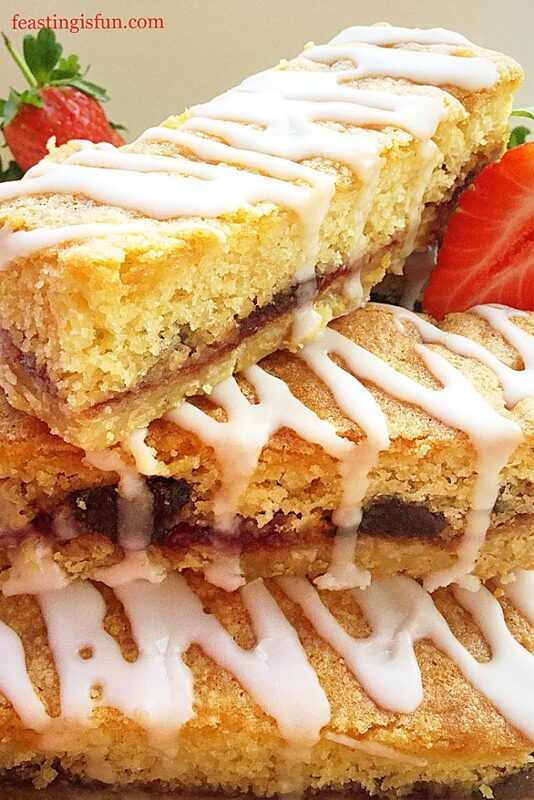 Using either a fork or a piping bag with a very small hole, drizzle the icing diagonally across each cake bar. 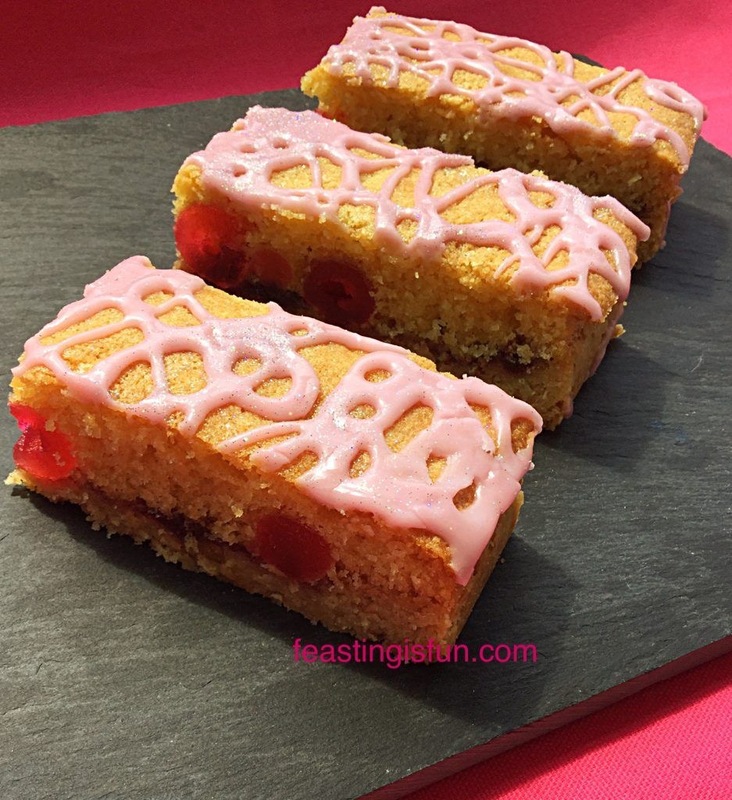 Portioning and decorating the Double Strawberry Cake Bars. As soon as the icing is set, the cake bars can be served or stored in an airtight container. 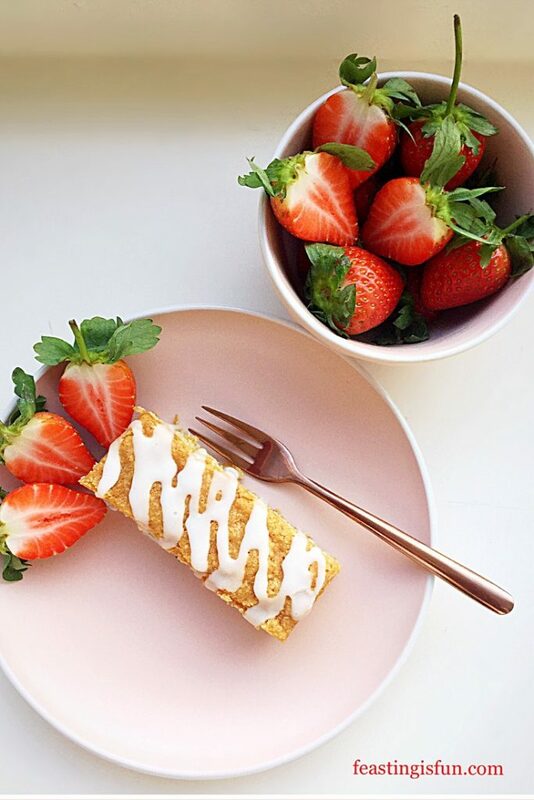 Finally, when serving, add fresh strawberries to the plate and stack the cake bars to create height. Because I am practical by nature, this naturally translates in the recipes I develop. For example, when making these for a picnic or outside event it is likely that I would leave off the drizzle. Simply to avoid attracting bugs and wasps. Although the lemon in the icing really does bring out the strawberry flavour. Perhaps adding a little lemon zest to the cake? And I’m off again, my head spinning with possibilities based around this one bake! Whatever you are making, baking and creating in your kitchens, have fun preparing sharing your feast. I, as some of you may know, am a self confessed Cookie Monster. 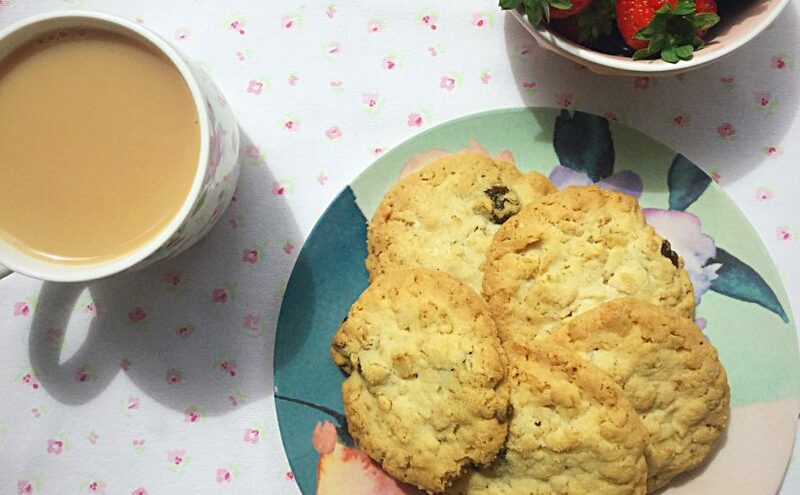 Since early childhood starting the day with a cup of tea and a biscuit has become a tradition. Something I have passed on to our children as well. As long as I’ve had my cuppa and biscuit/cookie I can face the day. Especially if I have to wait a while for breakfast. 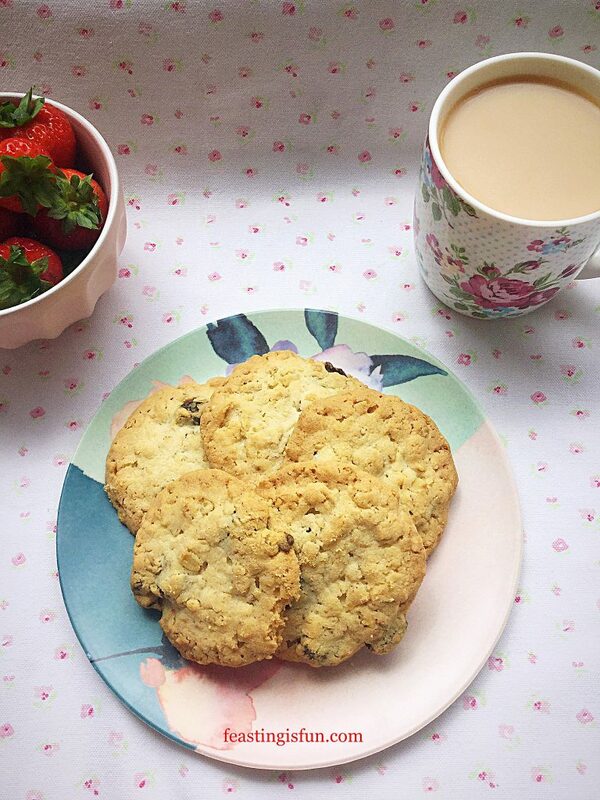 Oat and fruit cookies are among my favourites, obviously the children always prefer chocolate. 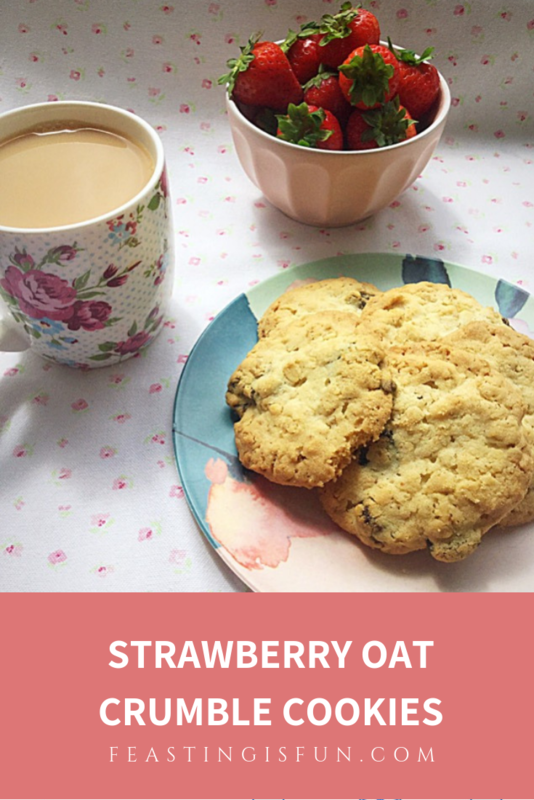 Yet, after tasting these Strawberry Oat Crumble Cookies there were smiles all round and they received a big thumbs up. 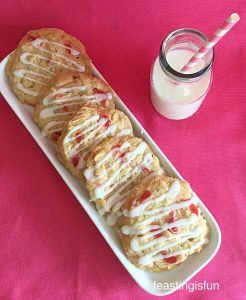 Since I discovered these baked strawberries from Urban Fruit I have loved adding them to bakes, such as my Double Strawberry Almond Muffins. Similar in texture to dried apricots, the baked strawberries are little pods of intense strawberry flavour. As well as being a delicious snack they are perfect for adding to bakes. 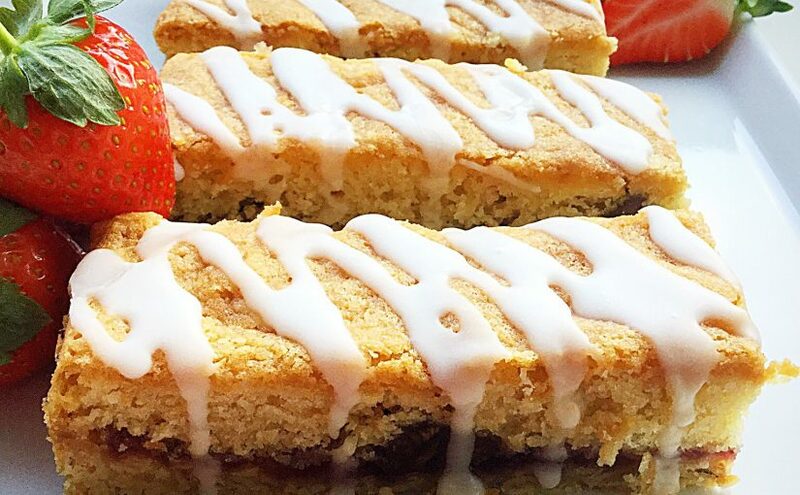 Because fresh strawberries are so full of water they can be difficult to add to dry bakes. 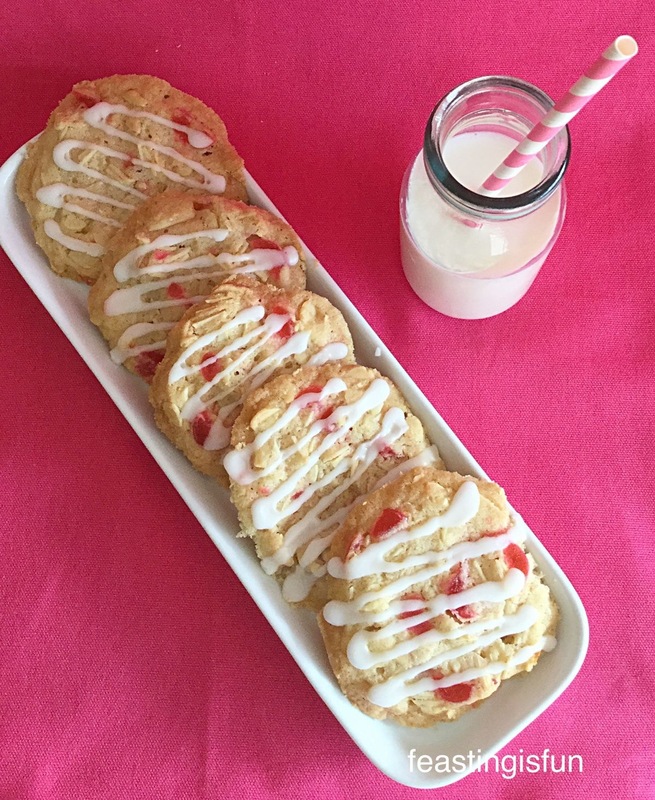 Whereas the chewy texture of the baked strawberries contrasts well in the oat crumble cookie. While I have used the snack pack strawberries from Urban Fruit I have also checked online and found similar products available to buy from both high street stores and online. I find it quite frustrating when wanting to try a recipe and it requires a specialist ingredient. Actually I bulk bought these baked strawberries from Amazon. First of all line 2 large baking trays with baking parchment. Add the egg yolk and vanilla extract. Continue whisking until fully incorporated. Next add the rolled oats. Using a sharp knife chop the baked strawberries in half. Add half of both the flour and strawberries to the bowl. 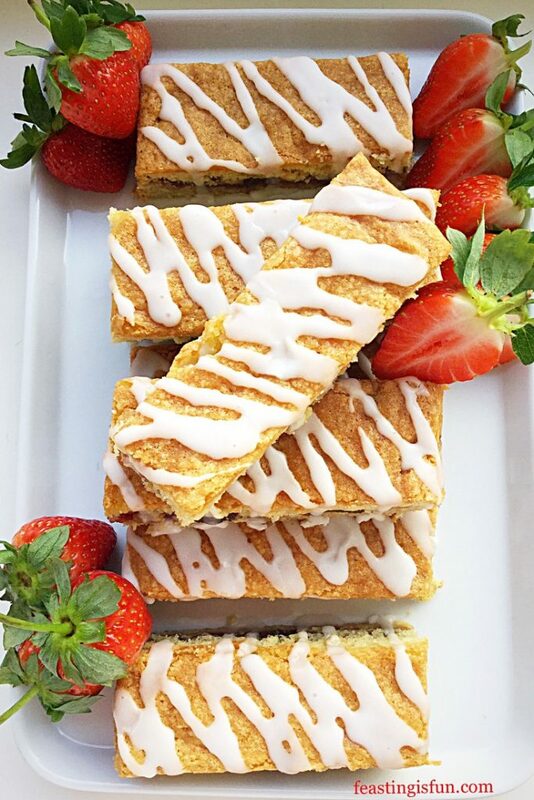 Toss the strawberries around in the flour, this will stop them sticking together. Add the remaining flour and strawberries and repeat as before. Using a spoon mix the cookie dough together. Place the cookie in the fridge for half an hour to chill and firm up. 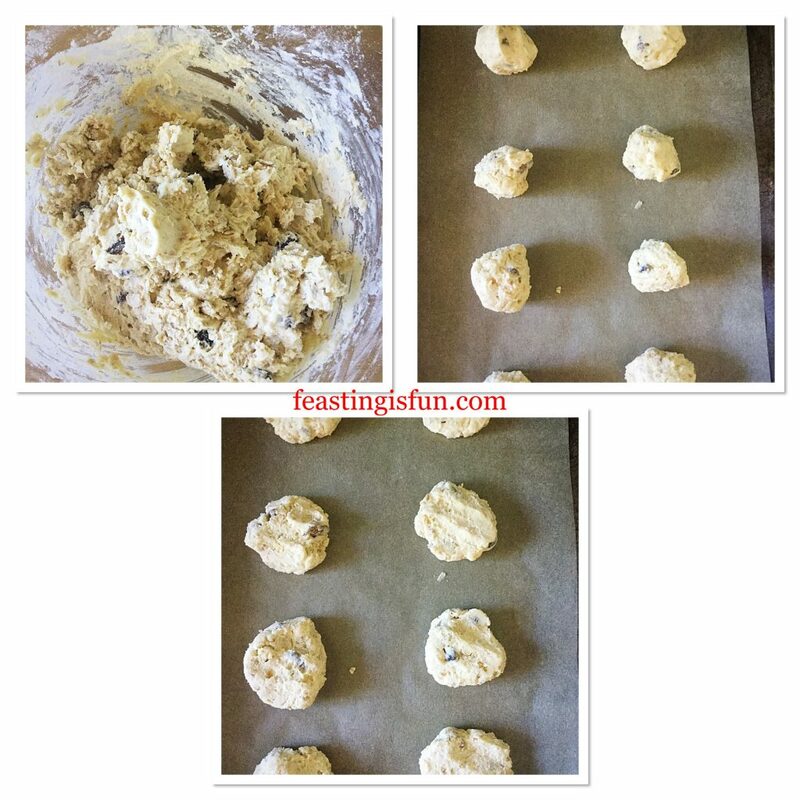 Remove a heaped teaspoon of cookie dough and roll into a ball. Place on the baking tray. Repeat until both baking trays are full. Gently press down with your fingers to flatten the dough ball. 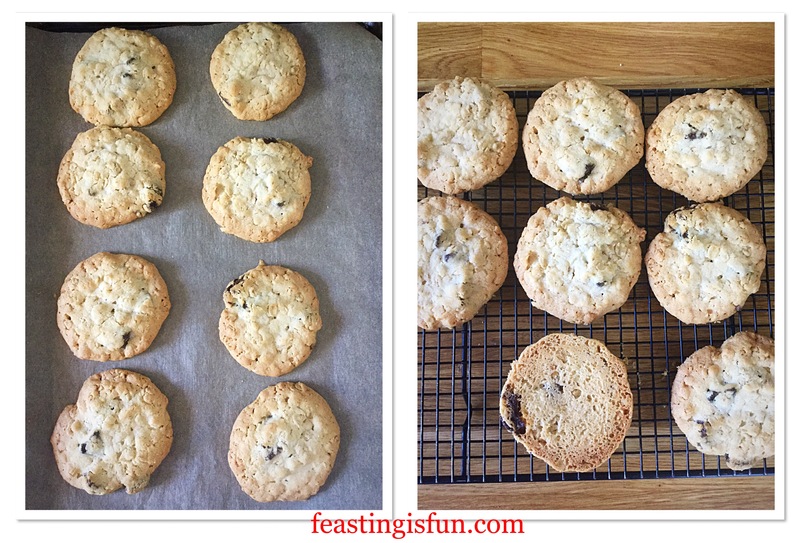 Note – I placed 8 cookies on each baking tray. 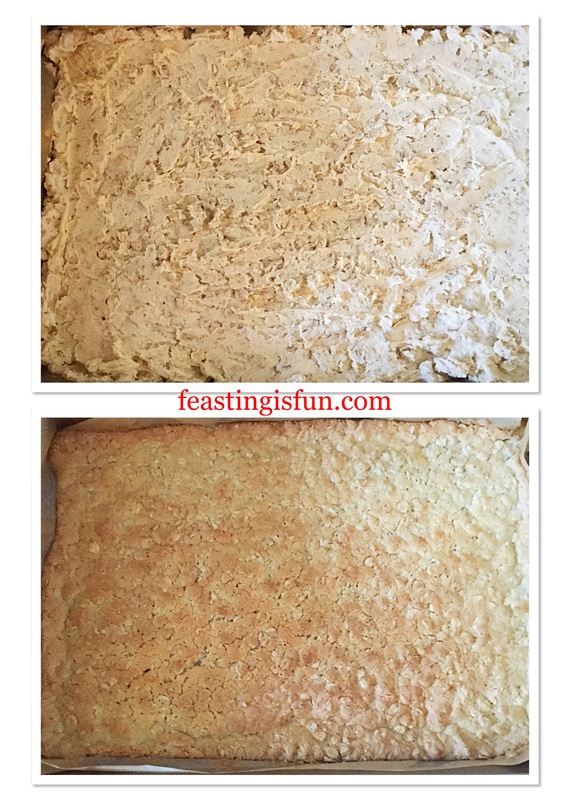 After baking and cooling I flipped over the baking parchment, added the remaining 5 cookies and baked them. Place the baking trays into the oven and bake the cookies for 20-25 minutes until golden brown. As soon as the cookies are baked remove from the oven. Leave to cool for 5 minutes on the tray and then transfer to a cooling rack. Check the underside of the cookie is golden. Leave the cookies to cool before serving. 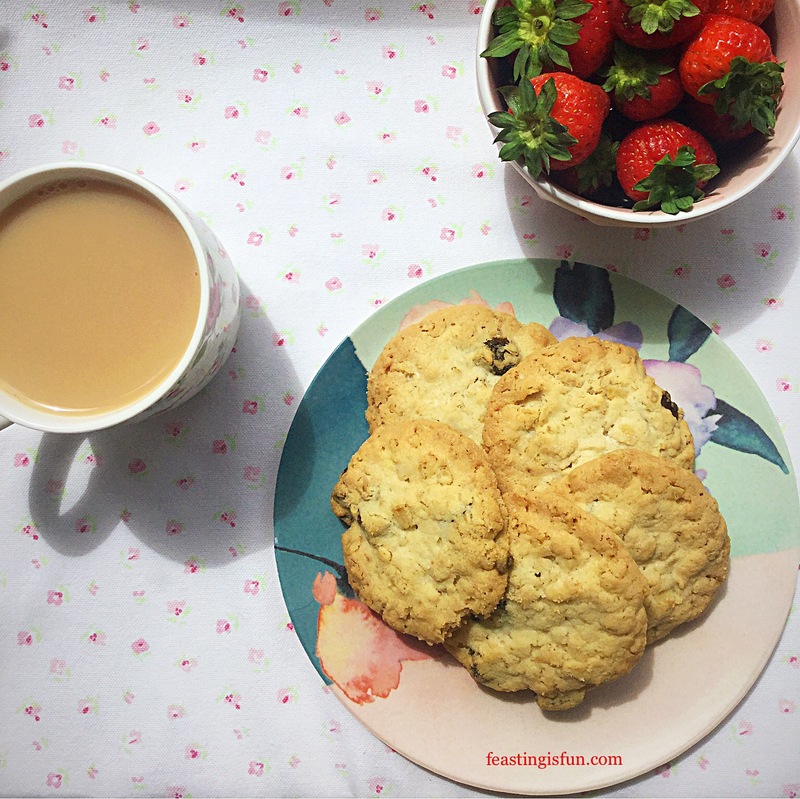 Who could resist a delicious crumbly, strawberry and oat cookie with a cup of tea? Not me! Once cooled store the cookies in an airtight container and eat within 5 days. I love baking cookies, especially to share with others. 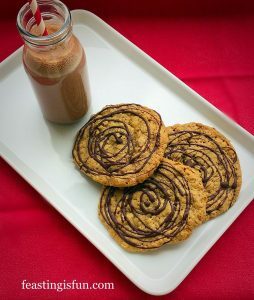 And while it would be a real stretch to call these cookies healthy, sneaking oats into the recipe does add extra goodness. Also, the oats give these cookies their delicious crumbly texture. 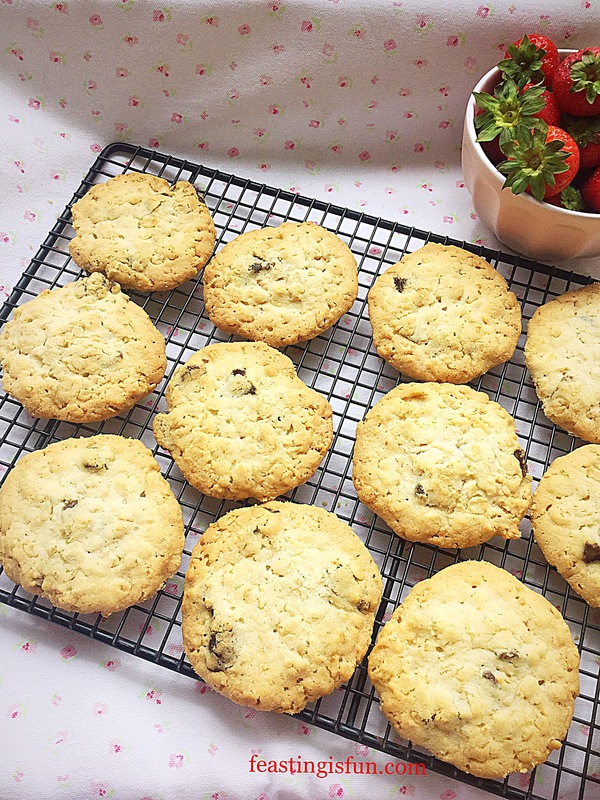 The perfect cookie to bake and take to your workplace and share with colleagues. Because all food tastes better when shared.